International Monetary Fund head Christine Lagarde's comments that stock market valuations had been "extremely high", spurred a meltdown in the US markets overnight, spilling over to Asia on Thursday. In a volatile trading session on Thursday, the barometer index, Sensex, had crashed over 1,000 points at one point. Expectations that the US Federal Reserve would continue to tighten rates also hurt demand for the Indian currency and equities. Selling was witnessed in banking, IT (information technology), metals, auto and capital goods stocks. 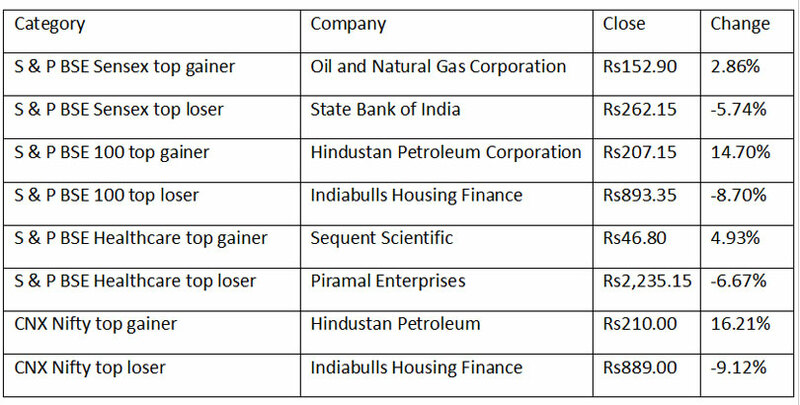 All 19 sector-based indices on the BSE, except the energy index, traded in the red. The rupee plunged to a fresh low on Thursday, as Indian equities joined a global sell-off amid mounting concerns growth would slow in the face of a trade war between the United States and China. Concerns that the US Federal Reserve would continue to tighten interest rates amid strengthening economy and labour market also sparked fears about capital outflows, hurting the rupee. Reliance Nippon Life Asset Management on Thursday announced it has received a mandate from the Employees' State Insurance Corporation (ESIC) to manage its funds. The fund manager received the mandate from ESIC after a competitive technical and financial bidding process. RNAM is currently managing, among others, funds of state-tun Employees' Provident Fund Organization and The Coal Mines Provident Fund Organization. As of June, the company had total assets worth Rs4.10 lakh crore under its management. The company’s shares closed at Rs153.00, down 0.91% on the NSE. Automobile manufacturer Tata Motors launched the next generation of compact sedan -- Tata Tigor -- in both petrol and diesel variants. According to Tata Motors, the petrol variant is priced between Rs5.20 lakh and Rs6.65 lakh, while the diesel-powered version's cost ranges between Rs6.09 lakh and Rs7.38 lakh. "The compact sedan segment has been an important space for the customers seeking premium-ness at best value coupled with bold and attractive looks," Guenter Butschek, CEO and MD, Tata Motors said in a statement. Tata Motors shares closed at Rs182.50, down 3.31% on the NSE. Automobile major Mahindra & Mahindra (M&M) launched the leasing service for retail buyers of its personal range of vehicles. According to the company, the lease rental service starts at Rs13,499 per month for KUV100NXT and Rs32,999 per month for XUV500. The lease offer will cater to individual leasing for working professionals and SMEs and will be available across 6 cities namely- Pune, Ahmedabad, Bangalore, Hyderabad, Mumbai and New Delhi in the first phase of launch. "In its next phase, the lease offering will be extended to 19 more cities across India. The lease offer will be available on Mahindra's personal portfolio of vehicles such as the KUV100, TUV300, Scorpio, Marazzo and XUV500," the statement said. Mahindra & Mahindra shares closed at Rs730.00, down 4.46% on the NSE. Kakinada SEZ, a subsidiary of GMR Infra, signed an MoU with the Andhra Pradesh Gas Development Corporation to get access to piped domestic natural gas for its upcoming 10,500-acre zone. The company’s shares closed at Rs15.90, down 3.05% on the NSE. Aurobindo Pharma has received final approval from the US FDA (Food & Drug Administration) to manufacture and market Azithromycin Oral Suspension 100, a generic version of Pfizer’s Zithromax® oral suspension. The drug is used to treat mild to moderate infections. The company’s shares closed at Rs751.00, down 3.67% on the NSE. Finance Companies: Buying Opportunity in Panic Selling?